Set yourself up for SUCCESS in your restaurant/foodservice venture. There's more to opening a restaurant than counting the money at the end of the day. To be successful follow these steps BEFORE you sign anything, such as the lease, or the loan documents, or the partner contracts. Unless you do your due diligence – "count the cost", months, even years before you think you will open, then you will find yourself struggling among many in the food service industry. Do your HOMEWORK. You ask, "What do I need to do? When do I do what? What do I need to know? How to I gather information? Who can help?" Frank Stocco, foodservice consultant and restaurant designer has written this book from his wealth and years of education, experience, success and failures. 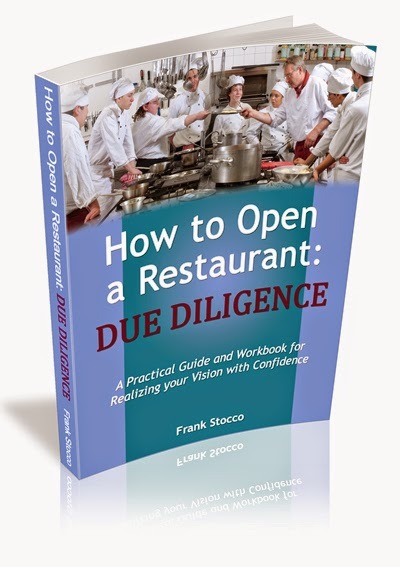 How to Open a Restaurant: Due Diligence is a MUST READ and a MUST DO, for SUCCESS in the restaurant business. Frank wrote this book as an instruction guide, with first steps first... It's a valuable investment for a little bit of money. Click on the BUY NOW button at the right. If you order the pdf download version to print off for yourself (it's cheaper), it can take up to 24 hours to receive the download link in your email.